Thank you so much Michael, for your heartfelt review. It was an honor to do such a meaningful portrait and I am so glad your family liked it too! I found Lena’s work purely by chance, and decided to have her make a portrait for me of something truly important to me and for my Mother. She was very understanding of the importance of this to me and that was reflected in the wonderful portrait that she did. When I was presented with it I was in awe of the detail and how everyone looked as not only I remembered them but reflecting their personality as well. It took some time to properly transport the portrait to my mother, but when I did her reaction was one of absolute joy. The entire family was stunned at how wonderful the portrait turned out and it now holds a prominent spot in our house for all to enjoy. Lena is a fantastic and immensely talented artist and there is no one else I would recommend to commission a portrait. Lena succeeded in creating a wonderful portrait of my parents from 5 different photographic elements. The rendition and result is a remarkable likeness and construction of the original composition of one of the photos. I am very appreciative of her talent and presentation. 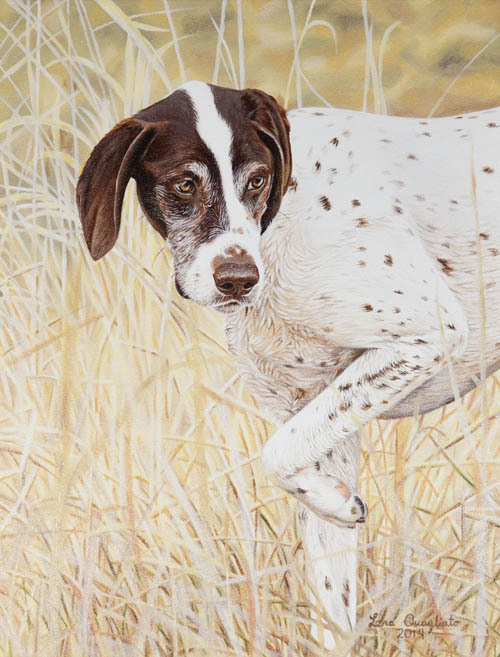 Lena has made 3 portraits so far for us, and each time we are blown away at how well she captures the personality of the dogs and cats, and how detailed the work is. She is truly talented and a pleasure to work with.